About last night... Proof these auction ideas work! You are here: Home / Administration / About last night… Proof these auction ideas work! A co-chair applied some newly learned auction ideas and landed a new sponsor for her public school auction. On behalf of our auction team, I wanted to thank you for meeting with us last night. We enjoyed your talk on procurement and we are fired up and ready to go after your ideas. This morning we got the PTA Chairs to approve the software agreement. I believe we can pay the full cost of the software with sponsorships. Well, as of this morning we have two more sponsors for our auction webpage. I didn’t even have any printed materials to show people—but they were willing to support our cause. We are all ready to take this auction to the next level! Last night I had an auction procurement consultation engagement with Francis Scott Key Elementary, a public school in Washington, D.C. At the end of our meeting, one of the Auction Chairs told me a story. She had listened to my Five Myths free call the previous night (Wed., Dec. 2), and she got fired up. The next morning (yesterday) she was in Starbucks waiting for her coffee. She noticed a flyer which was advertising the opening of a new pharmacy. With thoughts of the Five Myths call and new auction ideas running through her head, she walked over to the pharmacy and confidently (sort of) suggested that buying a sponsorship for her school auction in March would be an excellent way to get the word out about their new store. She had no sponsor packet. She had no sponsor levels to share. She hadn’t done this before. She couldn’t offer him anything, other than her enthusiastic belief that a new pharmacy should absolutely, positively buy a sponsorship because it would be a great way to get known to families living in the area. Way to go, Maria! I’m very proud of you. It takes courage to build the plane as you are flying it. Next step is to hustle back to the pharmacy today with some hot-off-the-press, brand-new sponsorship forms. 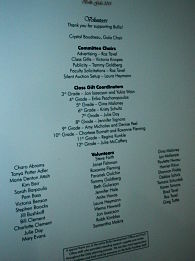 And friends, for more “proof” that these auction ideas work, read about this auction item donation.